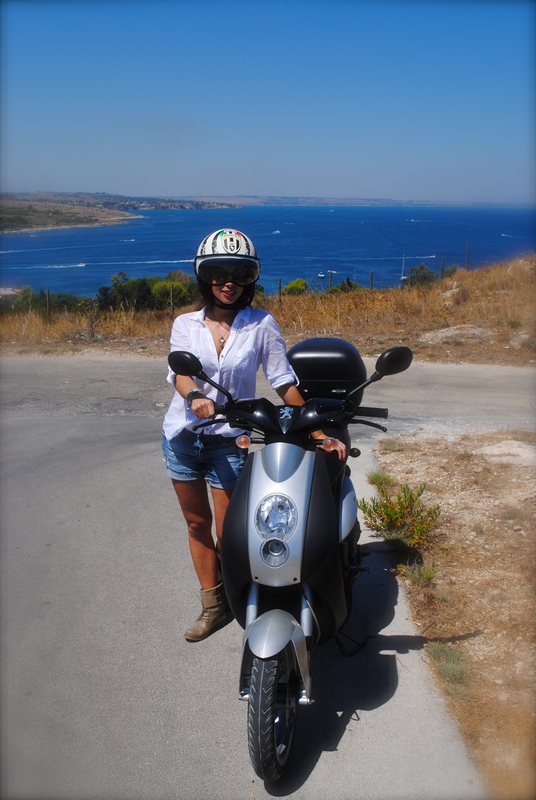 Before our roll-over vehicle accident in May, I picked out a scooter I’ve been yearning for since the day we found out we were moving to Italy. 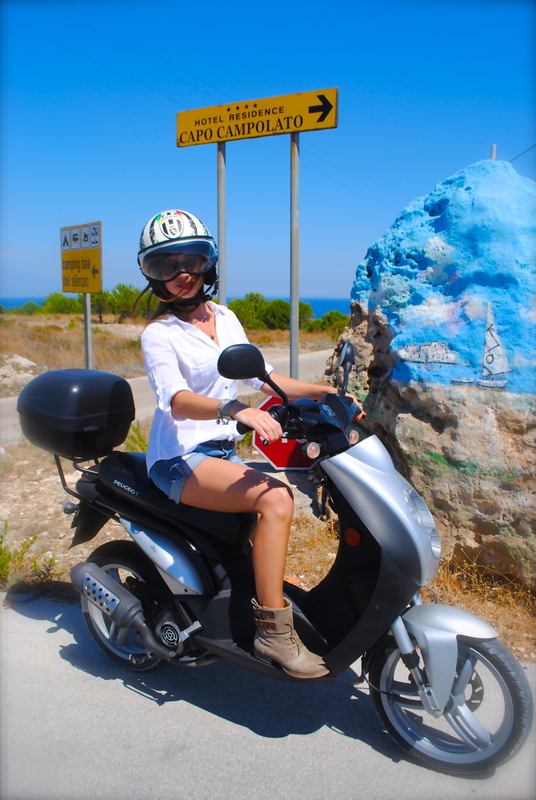 You can imagine Sicilian-Italians motoring around in various mopeds, zipping through busy narrow streets, congested traffic inter-ways and winding along country roads. In my case, I’ve got country roads with fantastic sea views. Yay! Today was a great day for a scooter lesson and some riding along streets of our neighbourhood mountain top. This was only the 2nd time I was able to enjoy a lesson since breaking my neck. I was really freaked out but was sure to take it real easy and of course I couldn’t help to break for a casual photo-op. Oh! Notice the Matty’s Curtis booties? Aren’t they perfect for scooter riding? Hmm.. maybe one day I’ll need to get a motorcycle? Umm..No! The view behind me is our local village of Brucoli. We live just below the trees and down the mountain you see pictured behind me. I like your outfit. I like your smile. I like you! Noticed the boots first thing, love the pics you’re just tooooo cute, girlie – wish I could be there doing the same and your photographer did a great job . . . I can’t BELIEVE that any Italian shop would sell you a FRENCH scooter! Now I crave for a scooter! You look fab! I have really, really been wanting a scooter for Chicago but have been kind of scared about riding in traffic, however, I think you have tipped me over the age. If someone recovering from a traffic-accident-caused broken neck can do it, so can I! Yes! Th opularity of scooters here make it easier for me to feel comfortable riding it. However back in the States, I would never have considered it in such a rural area. I do plan on bringingit back to the states but highly doubt I’d ride it. It’s just a different lifestyle here. 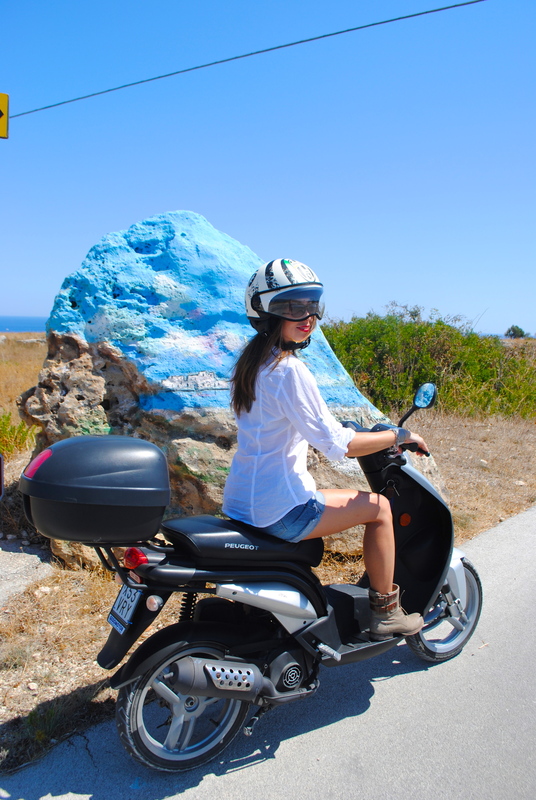 🙂 Thank you, are scooters popular in Greece? yup! but we never wear helmets!!!! Love it! Especially with the boots. What a stunning backdrop as well!! 🙂 Thank you, it was fun, needed a good break from a bit of riding. I’ll prob be keeping it in the garage just a few months more until I really feel safe back on the roads again. Country or not. Ugh just looked it up and Seb gave me the break down. I do’nt want to support a soccer team! I need a huge sticker now! LOL>. lovely pics, jeni! great locale too. 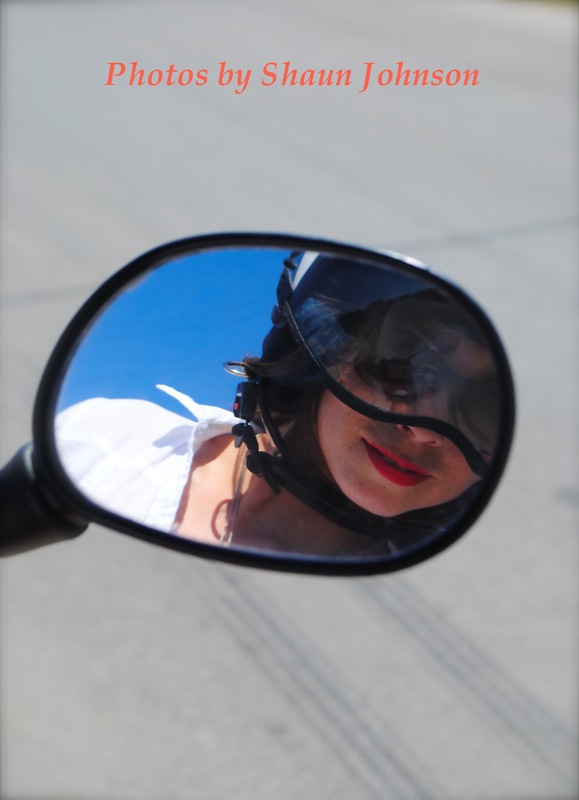 i could almost imagine myself riding a vespa in those parts. What a great back drop! Looks like a good time! Alway a fantastic pic, great view, fun day I’m sure. Love those boots! Great photos too:) Looks like fun! Beautiful photographs of you, Jeni!